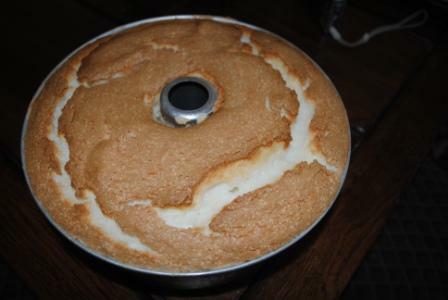 The angel food cake is believed to have originated back in the early 1800’s. The classic story behind the name “angel food cake” is that this dessert is so white, light, and fluffy it must be fit for angels. 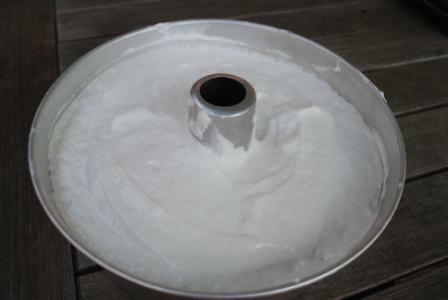 A traditional angel food cake pan is a tube pan with a removable bottom and when you take the baked cake out of the oven, you turn it upside down on a bottle so it will cool and not collapse. I also have a heart shaped angel food pan that makes a beautiful cake and you can buy individual angel food cake pans also for small individual cakes. I envision some pioneer woman with some sugar, flour and egg whites making this cake for the first time. I seem to imagine how I want things to be sometimes. Like going to the movie, if I don’t like the ending, I make up my own ending and I ALWAYS make a sequel. Same with this cake. Maybe SHE had made egg noodles for her family during the day and had all these egg whites left over and her family was whining for something sweet to eat. Of course she didn’t know how to make a souffle with those egg whites. After all, Julia hadn’t been born yet 🙂 — so she whips up a light and airy dessert for her family. Typically an angel food cake isn’t frosted. My mother always used a lemon glaze on the cake when he made one. Of course her cake was from scratch using about 12 egg whites. In my early years of cooking/baking I did make my cakes from scratch, especially if we were eating it without glaze or embellishments. I have crumbled angel food cake to make a “snowball” dessert, I have used it to make strawberry shortcake, filled it with chocolate whipped cream and dunked it in fondue. 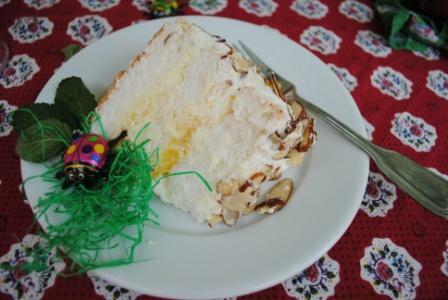 But, this recipe is one of my favorite ways to use Angel Food Cake and I do use a boxed mix. I don’t really like to buy the prepared angel food cakes already baked because they are never as high as the ones you make even from a box mix. 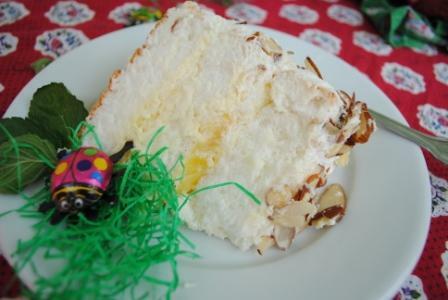 This cake can also be served as a slice of cake with a large dollop of the orange custard sauce on top and then sprinkle with the toasted almonds. It was nice having family and friends enjoy this cake for Easter this year and the good thing too is that there is only one large slice left and that is going to work with me tomorrow so I’m not tempted to eat it. I think that’s one thing I have always enjoyed about catering and that is seeing people enjoy what I prepare for a party. So, I hope someone is hungry tomorrow. Make sure your tube pan is clean, dry and grease free. Browned and ready to turn upside down. Turn your cake upside down on a pepper sauce bottle and let it cool upside down. That will prevent the cake from falling. Using a serrated knife, split the cake into 3 slices. 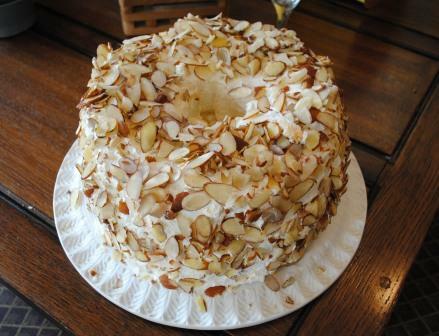 After filling, you frost it with sweetened whipped cream and press toasted almonds all around top and sides. I love the little beetle chocolate piece. Bake the angel food cake according to package directions and cool upside down on small bottle. When cooled completely remove from pan and cut into three layer. Heat 1/4 cup of the orange juice in a double boiler. Add the heated orange juice to the egg yolk (very slowly) whisking to blend. Put this back into the double boiler. Add the sugar, cornstarch and he remaining 1 1/4 cups of orange juice. Cook until thick. This may take 10-15 minutes. Add the butter and salt. Put into another bowl and cool in refrigerator. After this mixture is cooled, beat 1 cup of the whipping cream and fold into cooled custard. Put the first layer of the angle food cake onto your cake plate and top with half of the custard. Add the second layer of cake and put the remainder of the custard sauce and then top with remaining cake layer. Whip the remaining 2 cups whipping cream. If I have any of the custard sauce left in the bowl, I add this to the whipped cream. Frost the top and sides of the cake with the whipping cream and then press almonds across the top and sides of the cake to cover. Refrigerate until ready to serve. **Note–I have also prepared this recipe with buying a prepared cake already baked (or bake one and slice) and put the slice on the dessert plate, top with a large dollop of custard sauce, sprinkle with almonds and garnish with mint leaves. Both are delicious. 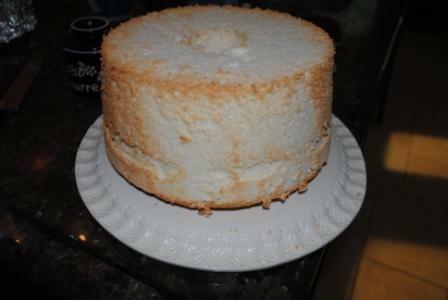 I have to admit that I have never made an angel food cake in my life. This looks fantastic with the decoration and extra flavour boost from the orange and almond. This is so light and refreshing. Hope you will try it.